The journal provides coverage spanning a broad spectrum of topics in all areas of experimental psychology, intended for a general readership. The journal is primarily dedicated to the publication of theory and review articles and brief reports of outstanding experimental work. Areas of coverage include attention and perception, cognitive psychology, psycholinguistics, behavioral and cognitive neuroscience, memory, comparative psychology, social cognition, and cognitive development. 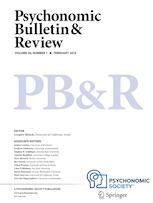 Psychonomic Bulletin & Review is a publication of the Psychonomic Society. Psychonomic Bulletin & Review is committed to upholding principles of integrity in scientific publishing and practice. As a member of the Committee on Publication Ethics (COPE), the journal will follow COPE guidelines concerning procedures for handling potential acts of professional misconduct.